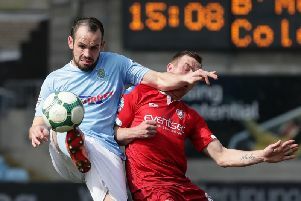 Eoin Bradley is determined to add to his Irish Cup winners medal collection. Skinner was part of the victorious Glenavon side who won the cup last season - and that day will live long in his memory. But the Glenullin manwants to create more cup memories following his return to Coleraine. He certainly did that on Saturday as the Bannsiders kick started their cup campaign. He bagged himself a hat-trick as the hosts romped to a 5-1 win over Carrick Rangers. “It was all about getting into the next round, but to get a hat-trick on my second home debut for Coleraine is very pleasing,” he told Times Sport. Bradley notched his first with 100 seconds on the clock and he wrapped up his treblee after a brace from strike partner Jordan Allan. “We’re building a good understanding,” said Skinner of his new partnership with Allan. “It started off at Windsor the other night, Jordan got the goal and we were unlucky not to get another couple. “Today he got two and I got three so the signs are good, hopefully it can continue now. “When we played Linfield we just talked about turning them and we carried that on today. “I think it was the first ball forward we got their defence turned and I managed to score. “We got the second soon after which helped settle us and we kicked on from there. Now the 33-year-old wants to go all the way with the Bannsiders. “I said to the boys in the changing room getting to the final and winning the Irish Cup last season was one of the best days in my sporting career,” he said. “Hopefully today is a good omen for us and we can kicked on in the tournament. “The boys are full of confidence and rightly so with three big results in a week. Boss Oran Kearney was delighted to see his side progress in the cup and for Bradley and Allan to hit the goal trail. “It has been a really good week with three wins on the bounce,” he said. “We put a lot of work in over the last three or four weeks to get Eoin back to the club. “And the last two games show why it was so important to get someone of that stature and quality back here. “It has been a really good week for Eoin and Jordan, but the team as a whole has been excellent. “We are in the next round of the cup and that’s all that matters. “I’d have taken 1-0, I’d have taken a last minute winner, the most important thing was to win the game.